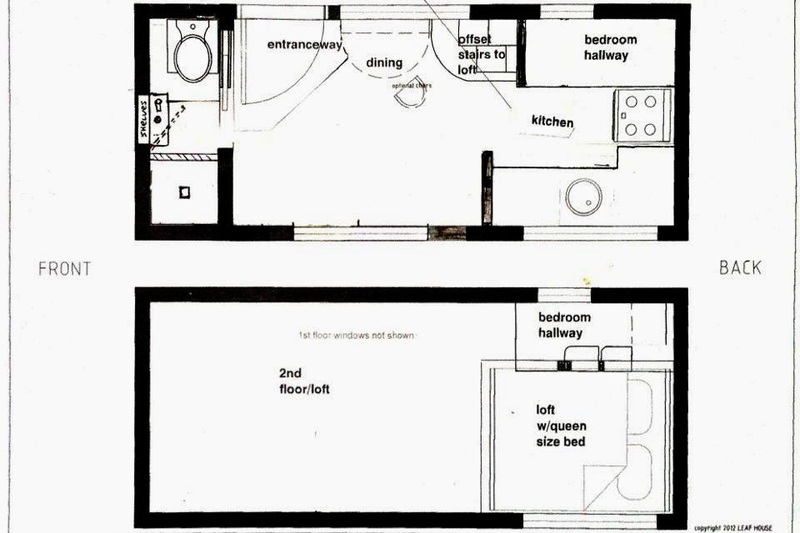 There are not a lot of companies selling technical drawings for non-toxic tiny homes. I only know of one: Tiny Green Cabins. Because I wanted a more modern style, I bought conventional plans from Leaf House. I wanted to change the layout to make the living room bigger, which entailed changing almost every other aspect of the design. 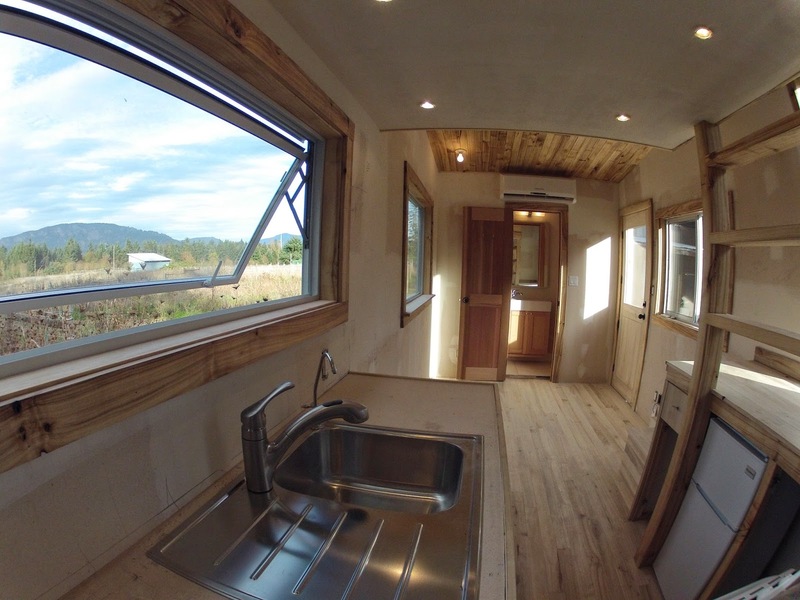 In a tiny house, one change in the floor plans can change everything. 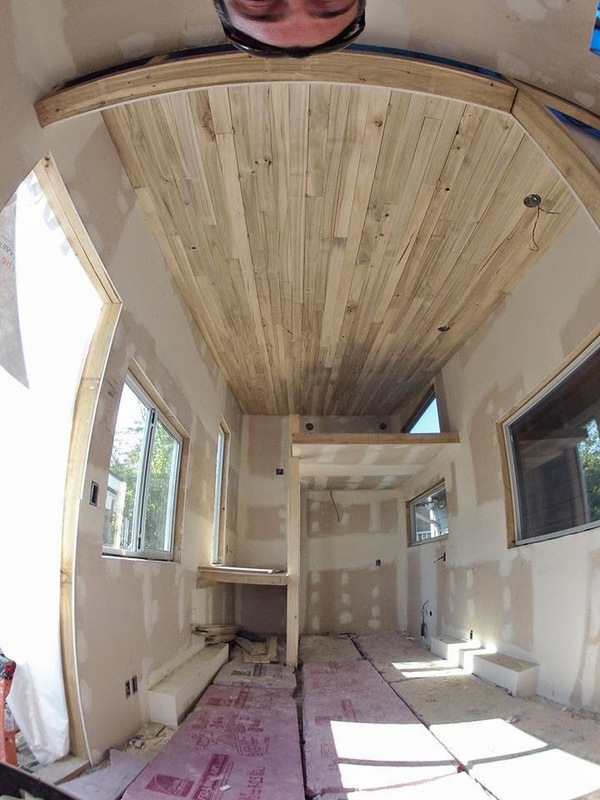 This ends up costing a lot more not just in time spent redrawing plans, but in recalculating all the supplies: lumber, the electrical system, the plumbing system, (custom) window sizes etc. A lot of time (months) was spent calculating and ordering supplies. A week was probably spent on window placement and sizes alone. In order to reduce costs, you might want to start with pre-fab window sizes and design around that. But it's way more efficient cost-wise to buy plans that are almost exactly how you want things to look. Change to non-toxic materials may demand changes to the plans such as changes to the framing in the flooring, changes to the thickness of the walls, ceiling, and floors (since insulation might be thicker), and changes to the weight. 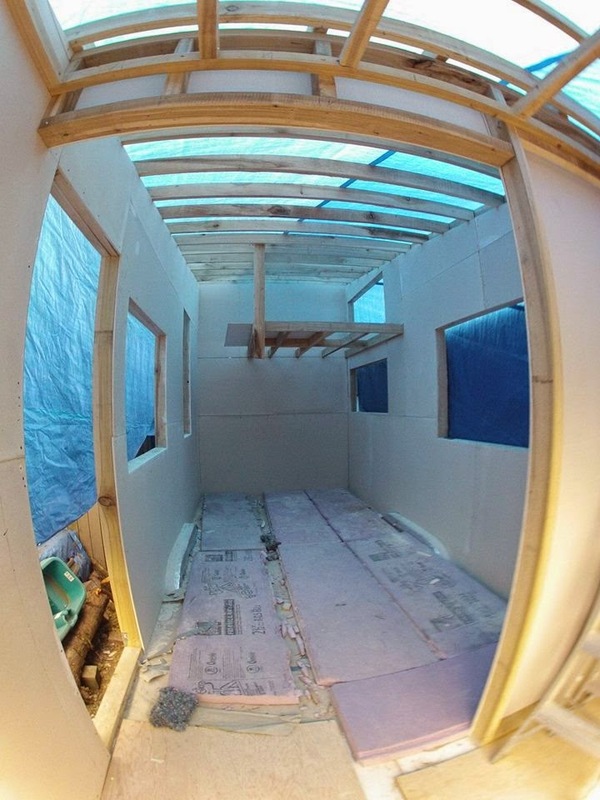 It is possible to build a non-toxic tiny home without changing anything substantial if you use plywood, and standard thickness insulation. Be careful when buying plans, the technical aspects may not be up to scruff. You will need an architect to review the design and moisture management system. I can't even imagine building with someone who did not have experience with natural building as well as a complete buy-in to the idea. Though many people now are choosing to go with someone local or someone very skilled. If they are open to the idea of green building and having you choose every material I would prefer a skilled builder over a "green builder" but they do have to have complete buy-in to the concept. 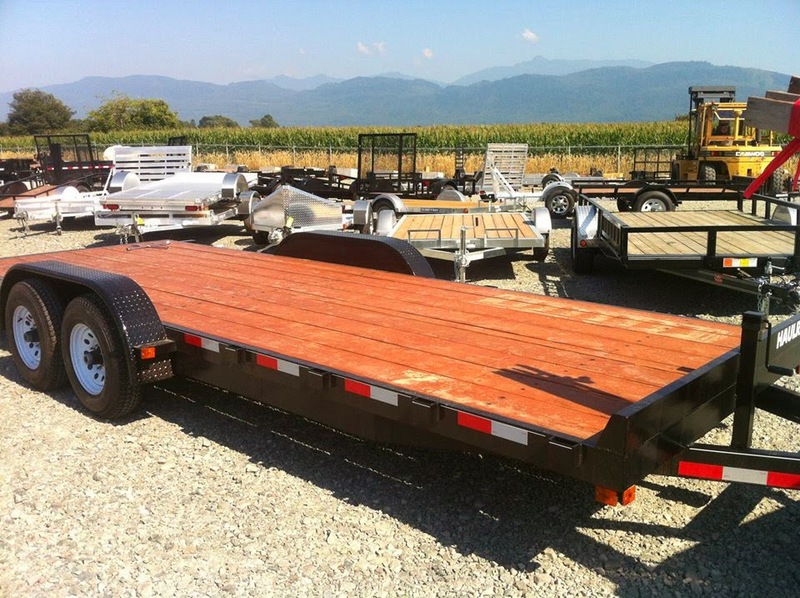 A big SNAFU was that the plans we bought were designed for a trailer rated at 10,000 lbs. If using MgO board or solid wood instead of plywood those are heavier that drywall and plywood; MgO siding or HardiePlank is heavier than wood siding; cotton and wool are heavier than foam insulation; and tiles or hardwood are heavier than vinyl or laminate flooring. A composting toilet is also fairly heavy. Those have to be considered before buying the trailer. Metal versus wood framing is a really important consideration. To oversimplify the issue, metal framing involves using a thermal break of either foam or bubble wrap. It gets a bit more complicated than that, but this discussion by Tiny Green Cabins should help. Another possibility is to build the walls out of metal. For someone who cannot tolerate wood or MgO board this is an interesting new option. Check out this post to learn more about that. Consider that having metal walls, including foil inside your walls can aggravate EMF issues and causes a lot of difficulties with moisture management. Consult with an architect before building a metal frame. This was one of the most confusing aspects of the build. Regulations vary from Province to Province and I'm assuming from State to State as well. In BC to get your house registered as a mobile home you have to have it built by a certified mobile home builder. Not getting mobile home certification means not being able to park and live at a mobile home park which is unfortunate. You can usually get certified as a travel trailer in. You must find out the requirement before building. 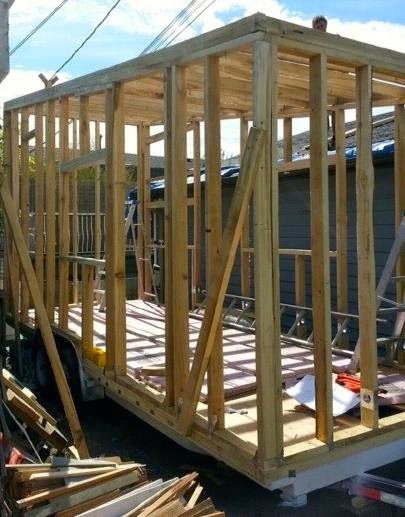 If you can't tow it legally it is way harder to move a tiny house. Some tiny houses have RVIA certification which gives you more flexibility with living in RV parks. You can then get house insurance as a mobile home or as a travel trailer or RV. If you are having someone in the US build it and importing to Canada it has to be RVIA certified. Factor in time to order samples and test materials for your own sensitivities. If you get sick easily, this will be a long and protracted stage as you find out what you can't tolerate by getting sick over and over. There needs to be time for recovery between testing. Definitely err on the side of caution as your sensitivities may increase once in a clean environment. It was a happy mistake that the finishing was left to me after delivery. the testing of wood stains/sealers/paints/tiles/tile sealers/shower materials has been a very long process and it has been much easier to do this slowly over time. Materials that I didn't react to when testing but now do include: cotton batt insulation (if you react to new clothing you will react to that), MgO board (I am on the fence about it - a few extremely sensitive people have said there is a slight reaction to it) and I have become much more sensitive to all paints and wood glues. I provide consultation services to help people navigate this complicated process of choosing materials. Many materials and appliances will need to offgas before use. I didn't do that well in my house for the first couple months so I would say even with the best materials there is wiring, there are plumbing and plumbing glue, there is wood glue, there will be some silicone - these all need some time to offgas. We left the appliances running for a month before use. I was lucky that I could move in immediately and left the window open for the first few weeks. Some people need a year to offgas a new house, even when every material was carefully selected. Many tiny homes are off the grid and use propane to power most systems, which is not an option for most MCS clients. Propane may be suitable for hot water heating, refrigeration and heat/AC, but the power for your stove/oven, compost toilet, lights, fans etc will need to be electric. Solar panels on the roof would only cover a small portion of the electrical. The new Tesla battery will open up some more options for solar in tiny homes. 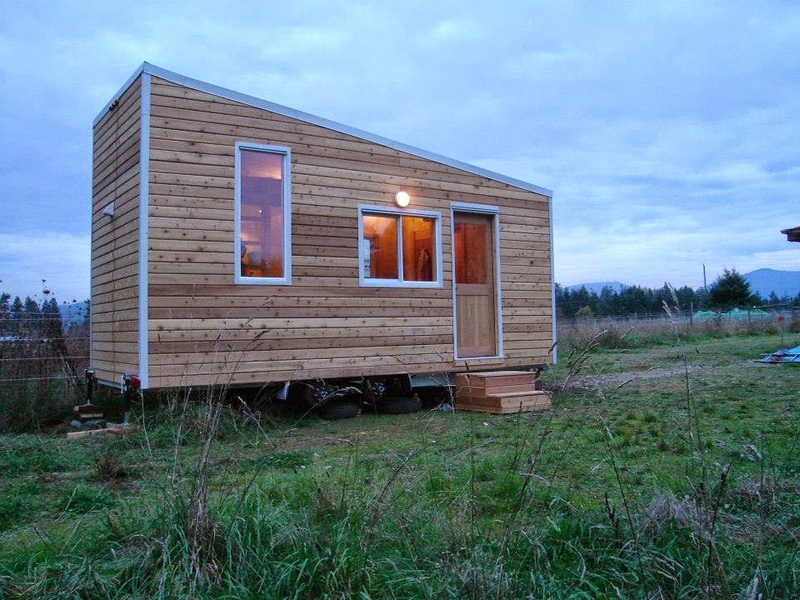 It is not possible to have a tiny house certified as a mobile home where I live, which excludes the possibility of parking at a mobile home park. It may be possible to park at an RV park if your electrical load is 60 amps or less and you have the proper plug for an RV park. You will also need RV sewage hookups. Having a tiny home certified by RVIA can have benefits in allowing you access to more RV parks. In many rural places you can have a tiny home on your own land, either legally or "just squatting", set up with electricity and water. Great post! So is it all offgassed and safe now? Do you know anything about Rolux insulation? Supposedly used for hospitals and babies. It sounded really good until I dug deeper and they use 8% formaldehyde in the adhesives, BUT of course they claim they bake it out so there is no offgassing. Who knows? It's such a game. I'm doing some small projects and thought I'd try the denim insulation on part and the Rolux on the other. The denim sounds like it's too thin to be helpful, and your issues with the offgassing is a concern. Sorry for my dyslexia - Roxul is the brand. Hello We build tiny homes and would love to have a chem free home to offer ppl! I want to build a toxin free home in the future, but I don't want a tiny house. Has anyone heard of any options for toxin free normal sized house builders and architects? There are builders that specialize in eco building. Check for one in your area. I am looking for some land on which to olace my 1975 viking mobile home. It has outgassed. I live in an hoa ib san marcos,ca. My lot has a great view, etc. Just want to be on my own land. I can have this transported and finish working on it. Thank you for this information and all of your efforts. I had Hardie siding board installed on my home in 2011. It has chippings along the edges of the numerous board. It carries warranties for 15 years again fading, but no mention of chipping. No chemicals or power washings were applied. What do you suggest?